During debate within the U.S. Congress regarding HR596, the Armenian Genocide Resolution, an infuriated Turkish government mounted an unprecedented all out assault on the historic fact of the Assyrian-Armenian-Greek Genocide of 1915. Well documented Turkish threats against the U.S. government were accompanied by even greater persecution of Turkey�s own citizenry. Quite regrettably, in early October, journalists from a major Turkish newspaper, Hurriyet, interviewed an Assyrian (Syriac) priest from St. Mary�s Syriac Orthodox Church in Diyarbakir with the hope of eliciting a Christian denial of the 1915 Holocaust. Rather than succumbing to the escalating hysteria of threats and intimidation within Turkey, Fr. Yusuf Akbulut instead confirmed that the Armenian genocide and insisted that Assyrians (Syriacs) had also been similarly victimized. Fr. Yusuf added that Kurds had also been willing accompliced in the killing and that the holocaust was an undeniable historic fact. Fr. Yusuf defiantly asserted that Bet Nahrain (Mesopotamia) is the land of the Assyrians (Syriacs) and that irrespective of U.S. Congressional action, "we will have our voices heard throughout the world." The Turkish response was predictably swift and brutal. On October 4, the Hurriyet newspaper carried an article with a photograph of Fr. Yusuf entitled "icimizdeki hain" meaning "A Traitor Amongst Us" with a subheading quoting Fr. Yusuf as saying "Not only Armenians were killed, Assyrians (Syriacs) were also killed." The outrage from within Turkey led Turkish military security agents to arrest Fr. 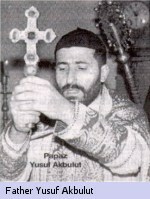 Yusuf on October 6 from his church in Diyarbakir. Although earlier reports had stated that Fr. Yusuf had been freed, in reality he remains imprisoned and charged with treason. Fr. Yusuf�s court date is scheduled in military court on December 21, 2000. Under Turkish law, the charge of treason, if sustained, is punishable by death. There is grave concern for Fr. Yusuf�s physical well being while he remains in Turkish custody. The vitriolic Hurriyet newspaper headline labeling Fr. Yusuf as a traitor to the Turkish nation is believed intended to stir passions and lead to vigilante or extra judicial attacks against Fr. Yusuf by fundamentalists or security forces. Moreover, there is reason to believe that Fr. Yusuf is being physically and psychological mistreated as he awaits word on his possible execution if he is found guilty of treason. Thus far, Fr. Yusuf has not been allowed visitor or adequate legal defense. The Turkish government has likewise increasingly threatened other members of the Assyrian (Syriac) community into condemning Fr. Yusuf�s statements. Some clergy, terrified at the prospects of a renewed campaign of persecution against the remaining few thousand Assyrian (Syriac) Christians in southeastern Turkey, had acquiesced in the face of these mounting threats. The arrest of Fr. Yusuf and the subsequent threats against the Assyrian (Syriac) community in southeastern Turkey underscore Turkey�s insecurity in dealing with its bloody past and with its present day Assyrian (Syriac) Christian minority. Now clamoring to join the European Union, Turkey continues to demonstrate a primitive, draconian approach to historical and political debate with a penchant for brutality and intolerance. Despite universal and continuous international criticism of its behavior, Turkey continues to show a perverse disdain for any semblance of civility. Still more, despite the international community�s insistence on greater openness and tolerance, Turkey still refuses to show any proclivity towards respect for even the most basic of human rights. We of the Assyrian Democratic Organization demand that Turkey immediately and unconditionally release Fr. Yusuf Akbulut and end the menacing intimidation of the Assyrian (Syriac) community. We also demand Turkey�s acknowledgement of its role in the Assyrian-Armenian-Greek Holocaust. SBS telephone interview with Fr. Yusuf. Assyrian Awareness Campaign, PLEASE SIGN THE PETITION.